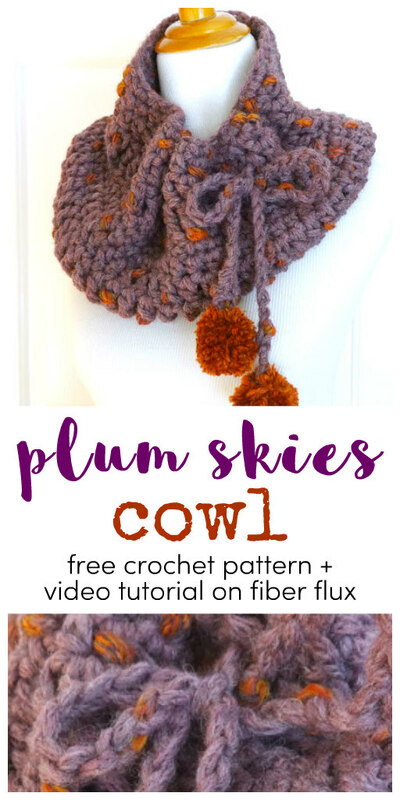 The Plum Skies Cowl is a beautiful and cozy cowl that is fun to wear too! 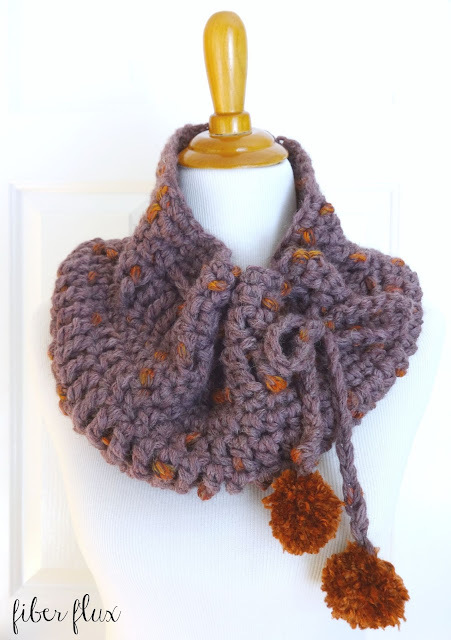 Crocheted with a variety of basic stitches it is not only easy, but each round worked provides a little variety without being overly complicated. The cowl is finished off with a matching drawstring and fabulous pom poms. Ch 54, join in the furthest ch from the hook with a sl st. Round 1: Ch 1 and work a sc in each ch, join to close round with a sl st. Round 2: Ch 2 (counts as a hdc). Work a hdc in the next st and in each st. Join to close round with a sl st. Round 3: Ch 3 (counts as a dc). Work a dc in the next st and in each st. Join to close round with a sl st. Round 4: Ch 4 (counts as a tr). Work a tr in the next st and in each st. Join to close round with a sl st.
Repeat rounds 1-4 until cowl is is tall as you would like it to be. Note: the first time you work round 1 you'll work into the chains but each time after, you'll be working into the stitches of the previous round. 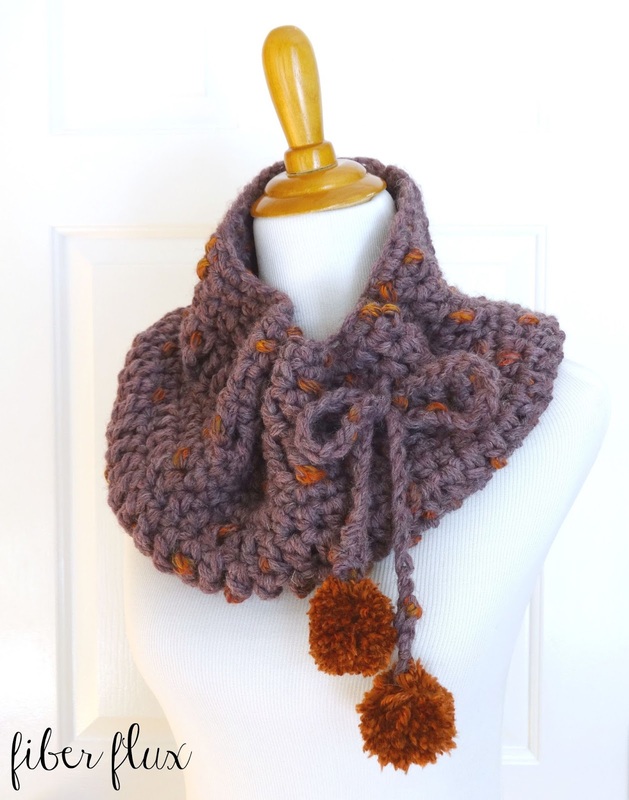 With the yarn and hook I used I was able to work rounds 1-4 twice, leaving me just enough to make the drawstring. Fasten off and weave in ends. With remaining yarn, make a chain about 40 inches long. Fasten off. 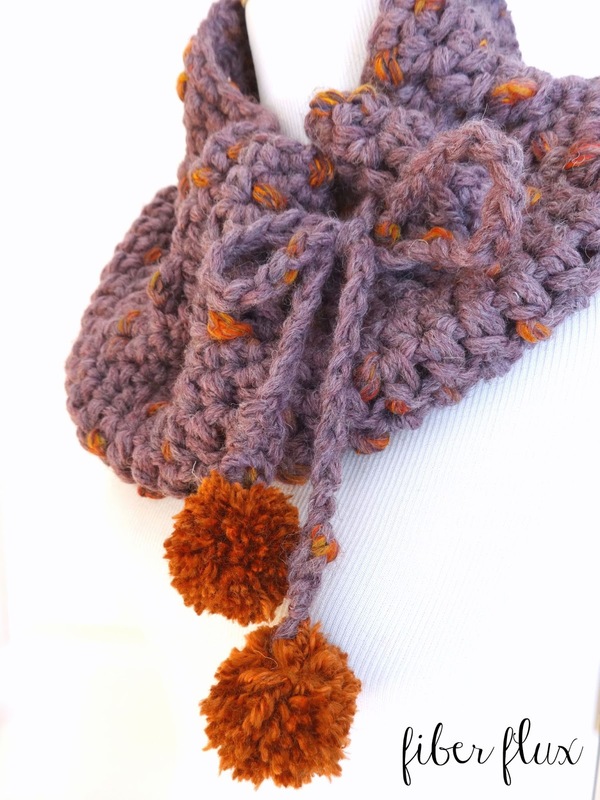 Make two pom poms (see tutorial link above if you need help) and tie onto each end of the drawstring. Weave in any ends that remain. This is the first time I have seen a cowl with drawstrings. I like the concept a lot!